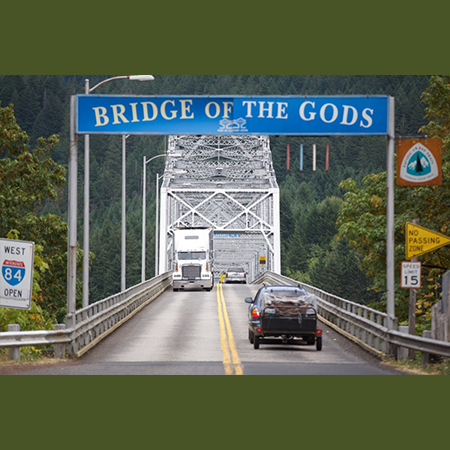 The Bridge of the Gods is an icon in the Columbia River Gorge. Connecting the Washington and Oregon sides of the Gorge at Cascade Locks, OR and near Stevenson, WA, it doesn't quite have the natural allure of Multnomah Falls, but it is one of the most famous man made structures in the Gorge. From it's namesake rooted in stories from local tribes to it's recent feature in a major film, the Bridge of the Gods has a long history. Stories passed through generations by local tribes tell how a great landslide, perhaps a thousand years ago, blocked the Columbia River. The river pooled deeply behind the debris, eventually carving its way through the landside but leaving a sweeping arch that bridged the Columbia. The tribes called it Bridge of the Gods. The natural arch allowed easy passage across the great river. But then, according to tribal legend, Mount Hood to the south and Mount Adams to the north fought over a fair maiden and destroyed the bridge with their earthquakes, eruptions and lava flows. With a perfect name already established, a new steel and concrete Bridge of the Gods was started in 1920 at Cascade Locks, 45 miles east of Portland. It was eventually finished in 1926. When the Bonneville Dam construction downstream in the mid-1930s caused the river to rise, the bridge needed to be raised 44 feet for shipping. The bridge took its present towering form in 1940 after one of the largest hydraulic jacking projects of its time. These days the bridge is a gateway to those who come hike, sail and bike in the natural beauty of the surrounding Columbia River Gorge. And everyone who crosses the bridge needs to stop at the "troll booth." One of only two toll bridges in Oregon, the pay station on the steel landmark over the Columbia River got its nickname in 1998 when frequent bridge users began dropping off plastic troll dolls at the bridge's south entrance. An 18-year employee of the Port of Cascade Locks, which owns the bridge, Pearson supervises seven bridge toll takers. As the senior employee, she usually gets a day shift but isn't above working graveyard when auto and truck traffic slows to a trickle over the third oldest road bridge on the lower Columbia. Everyone, including pedestrians, who crosses the bridge on the Oregon side must pay a toll – the amount varying depending on the size of the vehicle. "We look at our job as customer service,'' Pearson says. "P.R. is even more important than the money we take in. We want tourists to come back and visit towns on both sides of the river." Many more tourists are coming because of the bridge's recent starring role in the book and movie "Wild." Author Cheryl Strayed of Portland and actress Reese Witherspoon, who plays Strayed in the movie, end their journeys hiking the Pacific Crest Trail at Bridge of the Gods. "The wanting was a wilderness and I had to find my own way out of the woods," Strayed writes in "Wild: From Lost to Found on the Pacific Crest Trail." "It took me four years, seven months, and three days to do it. I didn't know where I was going until I got there. "It was a place called the Bridge of the Gods." Construction time: 1920-1926. It was raised from 1938 to 1940, after construction of Bonneville Dam to accommodate the higher water level. Significance: Third oldest road bridge across the lower Columbia River and located in one of the river's narrowest spots. Other notable fact: The bridge is the route of the Pacific Crest National Scenic Trail across the Columbia River. At 140 feet above the river, it is the low point of the 2,650-mile trail between Southern California and the northernmost tip of Washington state.